BBC Radio York interview with Laurie Dews (13/10/17) and with both Laurie Dews and David Lewis (21/09/17) both interviews took place on the Jonathan Cowap show. You'll be £14.99 closer to your next £10.00 credit when you purchase River Ouse Bargeman. What's this? The Ouse reaches into the heart of Yorkshire from the Humber Estuary. Until the 1980s, loaded barges made the challenging journey from Hull to Selby, bearing bulk cargoes for the mills of the town. The bargees had to be tough and resourceful; physically strong enough to handle their craft, wise enough to combat the rivers shifting currents and savvy enough to deal with those supplying short measure. Laurie Dews of Selby worked the Ouse from 1937 to 1987, and is now the only ,man remaining with first-hand experience of a lost way of life. In this book, "River Ouse Bargeman", Laurie's words of wit and wisdom give a skippers eye view of a barge loaded to the gunwales fighting upstream, unloading at the mill and drifting back with the tide. Laurie spins many a yarn about a bargeman's social life, too. His first-hand account includes the mysterious river crafts of singling out and penning up, the tricks and tell tales to show where the ever-shifting river channel lay and the camaraderie of life in the close-knit watery world. In this book, alongside Laurie's account, there is a factual commentary, illustrated by many images from Laurie's collection dating back over a century, and extracts from official documents and maps. Rather than ghost-write this biography, David Lewis has successfully woven Laurie's own words into his narrative. Illustrated with family photographs - that detail is its strength, Laurie's family should be pleased with the result. 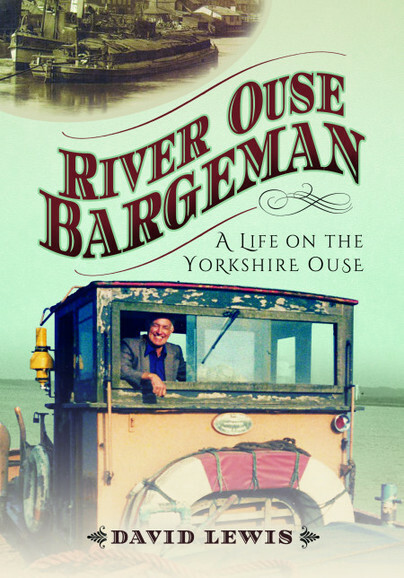 Laurie’s warm character shines through this book which stands as a testament both to the man and a snapshot of a time when the Yorkshire Ouse was alive with working barges. ... a valuable reminder of just how hard was the workday lives of the bargemen. While the book primarily tells Laurie's story, it is much more than a biography, with the author providing factual insights and commentary to contextualise and expand upon Laurie's (often amusing) anecdotes. Further insights are provided by a good number of excellent archive images dating back over a century, alongside official documents and maps. The work comes profusely illustrated, 144 photos in black and white and colour, most unpublished to be personal and the collection of the same Laurie. An interesting book that portrays a region and an era through the vicissitudes that occurred in the life of a river boatman, using water as the nexus and main element of the story. Packed full of photographs, diagrams, documents and lists it is a rich treasure of life afloat and the job of a lighterman on the river Ouse. Focusing on one family where father followed son into the work on the river we are treated to many remembrances of Lewis Drews of Selby who worked on the Ouse from 1937 to 1987, when he retired. It is a fascinating story of a previous way of life now superceded by road transport. It is Laurie's own account that makes this history live but the editing and connecting narrative by David Lewis means we have a classic. It details a way of life unfamiliar to most today and no longer a viable business in the modern world. It recounts the importance of rivers and waterways to the commerce of this nation and the lives of those close to the rivers who spent their lives afloat. It seems remarkable given the power of the river that goods were initially transported by dumb barges. That is, boats carrying up to 200 tons of cargo but withoutan engine. They relied on tides, heavy handed manoeuvres and tugs to pull and tow up to 4 barges in convey. At a time without radar, sonar and radio communication. All through the year at a time where there was no electricity, but a need for lights and little warmth other than produces by coal fires. These were harsh times yet each generation followed in their father's footsteps often having been on board from an early age. River knowledge was vital, not just to minimise delays and find the fastest course but also to avoid running aground or hitting a bridge support. Reading this book you realise how dangerous was their way of life; a fall overboard often meant death by drowing and many lives were lost simply doing their jobs. I loved the map of the river from Hull to Selby which was Laurie's working duty and his comments accompanying these maps was a highlight of the book for me. Anyone interested in canals, working boats or bygone ways of life will love this honest and revealing book of life beside and afloat the Ouse. It was a deeply satisfying read, insightful and the best kind of history to consider; recent, but lost forever. David moved to Yorkshire in the 1970s, rapidly learning to love life in the 'Broad Acres.' Whilst teaching Science for thirty years, his interest in historic transport infrastructure grew. He volunteers at the Naburn Lock site near York, was part of the campaign to save the Settle-Carlisle railway, and worked to help commemorate the airship industry at Howden. A post funded by the Heritage Lottery Fund involving investigating the history of Selby followed. In this guise, he devised school-based study and drama sessions concerning Selby's history, ran a 'pop-up' museum in town and led walks and talks for many local groups. This brought him into contact with the remarkable Laurie Dews the bargeman on whose recollections this book is based.